I think of Fried Green Tomatoes as a classic comfort food – but I never actually tried them until I recently made a hundred-year-old recipe. This is a food that I should have tried years ago. The Fried Green Tomatoes turned out wonderfully. They were delightful with a crispy cornmeal coating. Combine the water and 1 teaspoon salt in a mixing bowl, then soak the sliced tomatoes in the water for approximately 30 minutes. Remove the tomatoes from the water and drain on a paper towel, then lay the tomatoes in a single layer on a baking sheet, and sprinkle with sugar, salt, and pepper. Put the cornmeal in a small bowl, then roll each tomato slice in the cornmeal. Heat 1/2 inch of shortening or large in a large frying pan. Carefully place the breaded green tomato slices in the pan in a single layer. Depending upon pan size, the slices may need to be cooked in several batches. Fry for about 3 minutes or until the bottom side of each slice is lightly browned, then gently turn and fry until the other side is browned. Remove from pan and drain on paper towels. Serve immediately. Posted on September 16, 2018 September 15, 2018 by SherylPosted in FoodTagged green tomatoes, recipe. My mother would actually can green tomato slices to fry during the winter. We ate them often. Thanks for sharing. I like the idea of canning the green tomato slices. It would be a good way of preserving excess green tomatoes right before the frost for later use. Love them. On first try I didn’t though. I could almost hear my father say – “Take 3 bites of a new item, you don’t really get the flavor with one bite.” I’m glad I did, because I eat Fried Green tomatoes when I can!! You recipe wouldn’t leave my mind! It was driving me crazy, so I went out that night, got a green tomato!! Love it! 🙂 It’s nice to hear that you enjoyed it. Love fried tomatoes! To give them a different change of taste ,I use season salt,then next time old bay seasoning or add a little paprika to the salt and pepper version . It’s fun to hear the family discussion on which they liked best. I like how you season them in different ways to add variety. I’m particularly intrigued by the idea of seasoning green tomatoes with Old Bay. I love fried green tomatoes. They are a fun thing to eat on a BLT. I never would have thought of using green tomatoes in a B.L.T. I love B.L.T. sandwiches and will have to give this a try. I loved the movie, and love the real thing on my plate. This is a nice, easy way to do them. I’ve never seen the movie. I may have to look for it at the library. I think you’d like it. I enjoyed it enough that I saw it twice. I can’t remember eating the tomatoes green, but my Mom fried ripe tomatoes like that. One hundred-year-old cookbook that I have has recipes for both fried green tomatoes and fried tomatoes. Love fried green tomatoes! Unfortunately, it’s not easy to get green tomatoes even at the farm stand these days. Guess people are less enthusiastic about buying them. I have also found it difficult to find green tomatoes. I couldn’t find them anywhere. I finally asked at a farm stand, and they picked some especially for me. I had to go back several days later to get them. I’ve never tried green tomatoes. They never appealed. But reading these comments tells me I’m missing out. Hmm. First find your green tomatoes…. You should give them a try. I think that you’d like green tomatoes – though they can be difficult to find. My mother prepared fried green tomatoes at the end of the season when they wouldn’t have time to ripen on the vine. I wish I could taste hers one more time. When I was a child, we always picked green tomatoes when we thought there was going to be a frost. I bet that your mother’s fried green tomatoes were yummy. What does the initial soaking accomplish? I’m not sure, but I’m guessing that the salt draws some of the liquid out of the slices. I had never heard of these before that movie came out. But I’ve eaten them since (ordered from a restaurant) and they were actually quite good. Thanks for the recipe! You’re welcome! I agree – fried green tomatoes are quite tasty. I grew up eating fried green tomatoes and still love them! I make them like my mother and grandmother did. Dip the slices in milk and then dredge in seasoned flour before frying. I need to try your recipe, the corn meal reminds me of fried okra (which I also love). 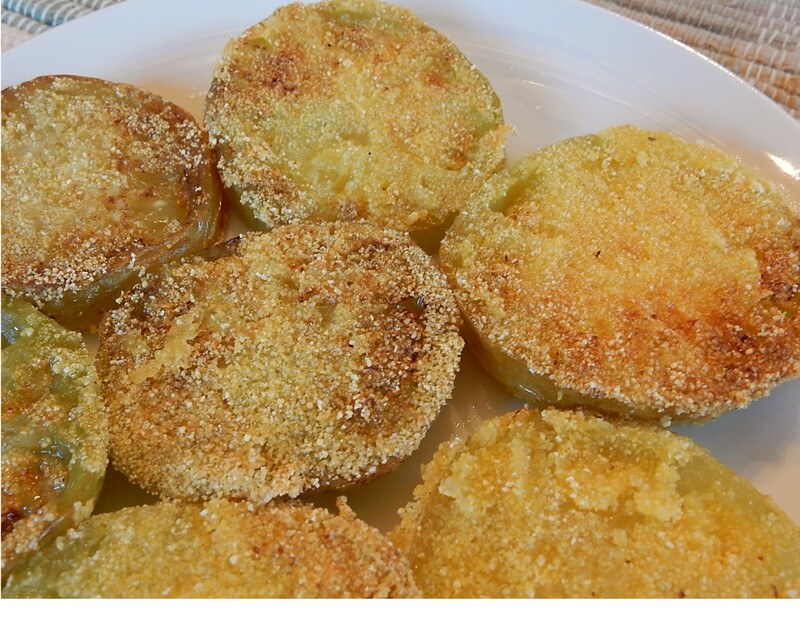 The method that you use to make Fried Green Tomatoes also sounds really good. It’s very similar to how I make Fried Zucchini. My mother also fried squash and eggplant with the flour. I’ve never had fried green tomatoes and like others, I never knew of them until the movie (and book) came out, but these look delicious, like they’d melt in your mouth! If you can find green tomatoes, you should give them a try. I think that you’d enjoy them.